Welcome to this edition of Friday Favorites! What's up this week? First up, please help me think-along. What is your opinion on the color of this dress? Lately, I've been wanting to transition away from wearing my beloved pencil skirts as frequently, so have been searching for dresses that would have some style, be heat and humidity friendly, and not have a defined waist. I generally wear brighter colors, but wanted to add some more blue shades to my summer wardrobe. The above Arnaud dress was ordered from Sundance Catalog. A second dress was supposed to be on its way, but is back ordered until the end of June. I also photographed it with lighter accessories (not shown) and that did make a difference, it looks much better with the higher contrast necklace/shoes shown here. It's got a bit of a hi-low hem and I think it may be a good time to get a slip extender. While the hem is loose cut and doesn't feel short, the photos tell a different story, at least I think so, what about you? Also, I may need to get my white-girl legs out in the sun, or follow my friend Kellyann's tips for using self tanner. While I'm on the subject, I wanted to find the least expensive extender I could find. These are all from Amazon in the $20 range and of the various reviews I read, most women seem to be happy with them, other than the tip to generally size up. If you've tried these and have a favorite, please leave a note in the comment section. I'm thinking a taupe color would blend in more with the color of the dress. I got to spend some time with this little sweetheart. The school does a really nice job with the program. It starts with snacks and drinks for just the grandparents, followed by time in the classroom, then finishes with each grade performing it's own poem/song/recitation. 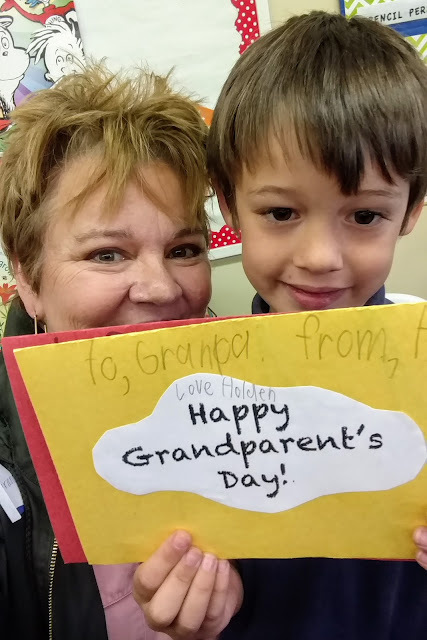 He did miss Grandpa, though, who is TX. 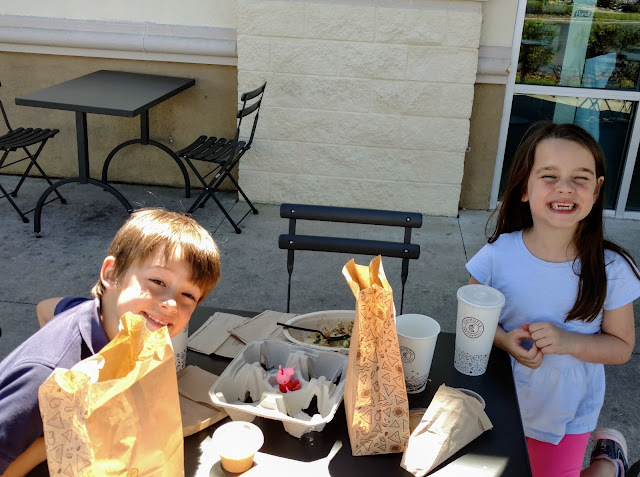 After the Grandparent's program I went to pick up Lil' Sis and we all went to Chipotle's The Grands wanted to eat outside (it was a beautiful day). Their lunch consisted pretty much of chips and soda. I think they had more fun chasing around the napkins and other things the wind was blowing all over the place than actually eating, anyway. This is the littlest Grand and younger sib to the above two. He's a year old and is doing the stiff-legged toddler walk. Darling Daughter went out of town on business (she works for my husband's company, so "yes," she was also in TX). Are you sensing a theme? This little guy was at my house for three days/two nights. Once last look at the dress before you weigh in! Is the blue a Yay or Nay?